Send an ecard with a design that combines numerous contemporary ideas with classic imagery this December to your clients. 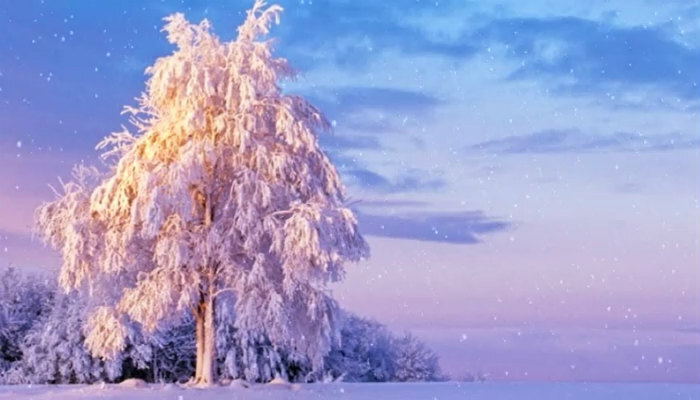 ‘Winter’s Morning’, one of our vast range of corporate holiday ecards, contains a beautiful winter image of a single tree. The design of this corporate ecard makes bold use of colour to give a truly magical ecard. The main focus of this design is a large tree, taking up the majority of the left side of the holiday ecard. The tree stands tall and proud, with its evergreen leaves bowing under the weight of the snow that has fallen on top of them. A golden light smatters the plant, too, as the morning sun rises to bask the scene in a warming yellow glow. In the background, a clearing of trees sits just behind this solitary tree off in the distance, making the image of this single plant that much more impressive. Snow covers the ground all around, glowing in the morning sun. A pale sky serves only to make this entire scene even more breathtaking. ‘Winter’s Morning’ is a firm favourite and bestseller here at eCO2 Greetings. If, however, this is not the design for you, we have an extensive range of corporate Christmas ecards from which to choose, as well as opportunities to design your own Christmas ecards.